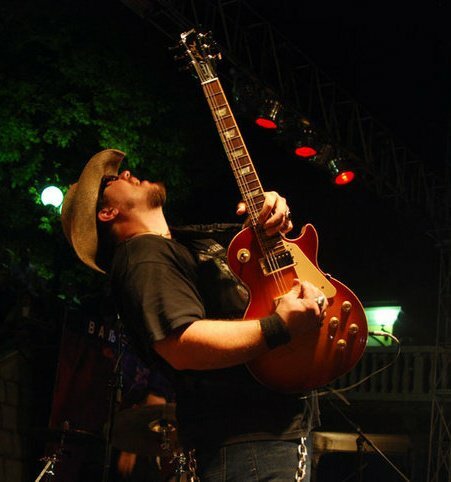 There's no doubt about it, the state of Texas is well known world wide for its fiery blues guitar players. Even just a cursory look will reveal the state's rich tradition, which easily rivals Chicago and Mississippi for producing players who have been both originators and contributors to the legacy of the guitar's significant role in the genre's history. Dating back to the 1920's with "Blind" Lemon Jefferson, continuing through the 1950's with such legends as Freddie King, T-Bone Walker and "Lightning" Hopkins, with the advent of the rock era of the 1960's the pressure cooker exploded. Albino blues giant Johnny Winter, from Beaumont, in 1968 was signed to what was then the largest advance in the history of the recording industry---$600,000. Houston's ZZ Top, with the Reverend Willie G, i.e. Billy F. Gibbons - armed with a '59 Les Paul- during the 70's went from being "That little ol' band from Texas" to being world wide ambassadors with their unique brand of deep blues infused boogie rock. Although disco and subsequently new wave lessened blues rock's influence in the late 70's, by 1983 it was another native Texan, Dallas born Stevie Ray Vaughan, whose combination of raw blues mixed with Hendrix styled pyrotechnics spearheaded yet another resurrection as the genre rose its evil head once again. A breath of much needed fresh air amongst the synth heavy offerings on MTV and radio airwaves of the time, the guitarist's massive influence has extended long beyond his untimely, tragic death twenty years ago. One such player whom Vaughan touched the soul of was young, gifted blues/rock axeslinger Lance Lopez. Although born in Shreveport, Louisiana, at the age of 12, his family moved to Dallas, where with the exception of a spell back in New Orleans and Southwest Florida, the guitarist has called his home ever since. A professional musician since the age of 14 when he began playing local bars in and around the New Orleans, Louisiana area, at 17 he was hired by soul great Johnnie Taylor, with whom he toured for six months. By 18 he was hired as the band leader of blues legend Lucky Peterson's band, spending three years touring throughout the world. It was while with Peterson in Europe that he struck up a close friendship with the larger than life drummer Buddy Miles, subsequently becoming the guitarist for The Buddy Miles Express for a brief time. The former Band Of Gypsys legend would go on to mentor Lopez, leading to him co producing his debut album 'First Things First', along with Grammy winning producer Jay Newland (Norah Jones) which was released independently in 1998. From 2003 to 2007 Lopez recorded, and released three studio and one live CD for a small independent label, Grooveyard Records - all of which were heavily influenced by another of the guitarist's main influences - Jimi Hendrix. Despite the hindrance of being released on such a label, the albums are all prime examples of post Hendrix heavy blues, filled to the brim with awe inspiring fretwork, which led to him garnering a cult following amongst guitar fanatics world wide. Now after a three year break, Lopez is back with a brand new Jim Gaines (Stevie Ray Vaughan, Buddy Guy, Santana) produced studio album 'Salvation From Sundown'. Intentionally conceived as a more traditional Texas blues styled offering, it's the guitarist's most mature recording to date, showcasing strong songwriting while still retaining the red-hot fretwork which has elicited none other than guitar god Jeff Beck to call him "A very exciting and intense blues guitarist". His first release on a major label (Sony/MIG) it shows him poised to take his rightful place as one of the finest blues players on the planet. Nightwatcher's House Of Rock : First off Lance, I'd like to get into talking about your new album 'Salvation From Sundown', which has just been released in Europe through Sony/Made In Germany Records. How do you feel about the album, and how would you say it stacks up against your earlier releases? Lance Lopez : I feel really good about 'Salvation From Sundown'. Some of the songs I've had around for many years, and really wasn't able to record them due to the fact that some of them were ballads, and some were more of a straight forward blues thing. When I was with Grooveyard Records, I couldn't really do that kind of stuff. They were more into all the rock, funk, Robin Trower-ish type of stuff. Which is cool, but I had other songs that I wanted to do. When we went in to do this album the thing was to go in and make a really good blues record. That's why I thought of Jim Gaines right off the bat, because of the work he's done with Stevie Ray Vaughan, Albert Collins, and all those people. He produces great blues albums.That was the other side of it too. That if I was going to do this album, I was going to have a producer, be produced, and just go in and play guitar and sing. Not having to worry about anything else. Because on all my other recordings I produced all of them, besides the one that Eric Gales and I produced together. But even on that one I was involved. So it was good to have a producer. And not just any producer, but one of the best. That really made a big difference in everything. Having that objectivity. Not only by having Jim there, but also having some great engineers onboard, like Chris Bell, Adam Hill and Pete Matthews. Those guys are great, and they've done lots of great records. So it was good to have a team where they knew what they were doing, and knew what they were talking about. So it wasn't like the weight of the world rested on me. Because when I did those earlier recordings, like 'Wall Of Soul' and 'Simplify Your Vision', those were done in like three days. Cutting it all, mixing it and that was it. I can hear it in those recordings. I can hear them being rushed. So with this album I was able to take my time, be produced, come up with some songs which were musical, and I really was able to really think about my guitar solos, and be as tasteful and soulful as possible. So it was like let's actually say something this time versus just firing off a machine gun of notes. NHOR : Did you feel a lot more freedom doing the album this way versus how you had recorded previously? LL : Yeah it did. But at the same time I just really wanted to have some really good songs. There were some ideas that I'd come up with, and Jim would kind of reel me back in. He'd tell me, "Remember, we're doing a blues record"(Laughs). What was cool is that I had Jim to reel me back in when I'd want to start doing some crazy stuff. He also kept me in bounds in terms of remembering that I'd have to play all of this live. Whereas before, I'd get kind of crazy stacking guitars and doing a lot of stuff like that. That was good. It was kind of constrained, but it was a good kind of constraint to be under. I was able to think realistically about everything. LL : Right. I actually want to go on my next album and get an even more live sound. Because I did do some overdubs and stuff like that on this one. We had discussed with Jim, and he was telling us how Stevie Ray used to do it. He used to go in, like when they cut 'In Step', the whole band would cut live, and he'd cut his solos live to get the vibe. That meant that everybody had to do take after take after take. We even discussed that possibility, but I said no, I was using my road band and we really didn't have that kind of time. So we were like let's just cut these basic tracks, and then I'll just come back and overdub. But the next time around I think I definitely want to do a more live recording as opposed to going back and doing overdubs. At least some of it anyway. But yes, a lot of these were put together, being realistic , and to allow them to be reproduced live as close as we could get to the studio recordings. NHOR : The album was recorded at Ardent Studios in Memphis, which is the same studio that ZZ Top recorded 'Tres Hombres', 'Tejas', 'Deguello' and 'Eliminator', and Led Zeppelin recorded part of Led Zeppelin III. What was it like recording there? Do you feel like some of that magic is on this album? LL : Absolutely. Ardent Studios was a dream come true. We had been recording in Dallas, at Luminous Sound, and that is a pop studio. Jessica Simpson, Justin Timberlake, Kenny Chesney, and a lot of these newer artists have recorded there. It was very sterile. A great studio, with great people, but I wasn't able to get my vibe across recording there. It really came out when I started to sing, and record leads and stuff. I started not being comfortable. The tracking was okay, but when I went to really put my soul into it I started feeling stifled. I walked into Ardent Studios, and I recorded six vocal tracks in about an hour and a half. I just started knocking them down, man. Most of those vocal tracks were just one take. I walked in, sang it, and that was it. That's the kind of stuff that Ardent brought out. There is magic in that room. We were back in Studio C, and that's a special, special room. That's where ZZ Top did 'Eliminator'. A lot of really great stuff was recorded in that room. There's definitely something in those walls. It's an unbelievable room. NHOR : What type of gear did you use on this album? LL : Basically, people lent me a lot of stuff. I've developed relationships with a lot of collectors, through the Dallas Guitar Show. A lot of people with huge collections have befriended me, and I have a lot of good friends who are guitar collectors. So they got wind of me recording this new CD, and my phone started ringing. Everybody wanted me to use this on the record, use that. They brought me down tons of great amps. I had Kendrick amplifiers, a lot of old Marshalls, and a lot of old Fenders. At the end of the day, what started sounding the best...Jim and I went through all of them, and he went through like 30 different amps with Stevie Ray on 'In Step', that was insane. So, he started having horrible flashbacks (Laughs). When the studio started filling up with amplifiers he was like, "Oh God". But we went through them, and we went through some giant rigs, trying to capture this sound, and that sound. He was like, "No, that's not working". At the end of the day though, we just ended up going with my road rig. The other two amplifiers that I used were, a guy had brought in a Marshall 68 Super Lead Plexi, and an old original Bluesbreaker Combo, a real one. So we had two old original Marshalls,my 1970 Super Bass 100 and a reissue Fender Twin Reverb for a lot of the clean stuff. That was the crux of the sounds. For a lot of the harder, heavier stuff I just plugged in a Les Paul into that old Super Lead and the Bluesbreaker and just turned them up. Jim was really against changing the sound with pedals. He was like, live that's okay, but in the studio he wanted to get that overdriven sound of the Marshalls turned up. So for a lot of the crunch, that's what it is. There's also a lot of Strats on the album, so it was kind of half and half, guitar wise. Half Gibsons and half Fenders. But a lot of the album was just recorded with my road rig, the Super Bass and the Twin. NHOR : What are your favorite tracks on the album? LL : I really love the title track, "Salvation From Sundown". It's a pretty simple little riff, which I've had around forever. I've tried previously working it up on several different things, but it finally came together on this song, kind of at the last minute. We just started jamming on it, while we were recording, and eventually it just turned out the way it did. I really enjoy that track a lot, and some of the lead tones on it are really, really nice. I really like the smoothness and the fatness of the lead tracks. On some of the overdubs Jim got pretty epic with some of the lines that I was playing. That's one where we did start doing some multi tracking on, some guitar overdubs. We kind of went for the big "Spaghetti Western" epic lines, that "Good, The Bad & The Ugly" type of sound. (Laughs) That's the track on this album that stands out in my mind the most. LL : Yeah. I'd been out on the road, and somebody gave me a cassette of all of Ray Charles' first sessions. It was all the stuff he did with Jerry Wexler, his very first recordings. So I put it on, and we were riding around on the road listening to this old Ray Charles, and I was like, "Man, this stuff is so great!" I had a couple of them narrowed down that I wanted to do, so I ended up choosing that one. It really came out pretty good, I like it a lot. It swings really good. NHOR : This is definitely a more traditional Texas blues album in the sense that you've tamed down some of the wilder aspects of your playing which were up front on your previous albums, and focused on a more earthy, organic type sound. Are you happy with the reception that the album has received thus far? LL : Yes I am. I've had nothing but a lot of compliments on it. I have heard some things where some people were really wanting the real psychedelic, kind of over the top stuff. But the things was I was trying to be more musical on this album. Not so sporadic, just floor it and go type of jamming. If that's the case of what you want, you can just come out to the gig, and I'll do all that. That's the only thing negative that I've heard about it is that they were waiting on that stuff. On the majority , mass scale of things though I've heard nothing but good things, and everybody seems to really enjoy it because it is more musical. It's not just a bunch of jamming going on. Everybody can sort of relate to it because it's not so heavy and hard. NHOR : What is your usual process when you write songs? Do you start with a riff and work from there? LL : A lot of times I'll have a riff, or sometimes when I'm out driving or on the road, or just doing something in general, I'll hear a vocal line in my head, or a hook line, then I'll start singing that, and build around that. Or, I'll have multi riffs that I'll put stories to. It can go either way. Sometimes I'll come up with the lyrics, sometimes I'll come up with the music first. Nine times out of ten I'll come up with riffs out of jamming, at a live gig, perhaps from an extended part of another song. I'll do something and go, "Hey, that was nice. I need to come back and remember that." That's usually how I'll capture a riff sometimes, then I'll develop that riff, have it for awhile. I may have it a year or two before I even do anything with it. Then eventually I'll come up with a story, then I'll just go from there with it. Sometimes I'll wake up and say, "Hey, I'm going to write a song". Normally I'll let it naturally come to me, as opposed to saying, "Okay today we're going to write X, Y and Z. We're going to do this". It's more like I capture it as it comes to me. NHOR : The album as initially released in Europe, comes with a bonus DVD of the Rockpalast show you did last year in Germany. When this is released in the States, will there be a limited edition here as well? LL : I think MIG has said that they were going to reserve 500 discs for the U.S. market. I think there will be a limited run of 500 double disc sets released over here, and once those are gone, that'll be it. Then they will issue them separately. You'll have the 'Salvation From Sundown' CD, then the 'Lance Lopez Live at Rockpalast' DVD. NHOR : Speaking of Europe, you've been doing a lot of touring overseas as of late. What would you say are the biggest differences between audiences in Europe versus the U.S for you? Billy Gibbons and I had that discussion not too long ago. He said, "Man, I come all the way over to Switzerland, and I'm talking with someone about Charlie Patton, Son House, Robert Johnson and all the Delta Blues players, and I couldn't go to Jackson, Mississippi and sit down and talk to someone about them. And they're right in their back yard". It's crazy to me how that works. That's a big part of the history and archiving as a whole in Europe. They've always been that way. Ever since Freddie King, B.B. King and Muddy Waters were redelivered back to the United States by The Rolling Stones, Zeppelin and Cream. That's how I initially got it as a kid. I would read those album covers, look at "Crossroads" by Cream, and see Robert Johnson's name, and I thought I've got to go buy the original song. That's how I discovered those guys. I'd be reading the Zeppelin album covers and be going, "Okay, I need to check these guys out". It was redelivered to us from over there, and that's why it's always such a joy to go over there and play. NHOR : You even see that today with the success of Joe Bonamassa, who toured for years here in the States, but went over to the UK and has been embraced over there even more so than he has been here, and has really opened up things over there in terms of blues and blues rock. With his success, do you see things opening up more for you now? LL : I hope so. I've known Joe for many years, he's a good friend of mine, and seeing Joe on the rise as he has been, and everything good that's been happening lately for him is giving me some hope. Hopefully there's going to be a resurgence in the blues because of it. I think it's great what's happening with Joe. At one time we were going through it, working the trenches and doing a lot of shows together, so it's good to see him getting what he's getting. Hopefully one day soon I'll get that too. NHOR : Joe has had a lot of battles with the so called "blues purists". As a lot of your music, although very based in the blues hasn't been what one could call traditional blues, have you encountered those same sort of battles throughout your career? LL : Absolutely. Especially early on when I was young. Coming from Texas, that's like the land of the blues purist. But when I was a kid, I came up as a rock player. I was a rock player who discovered the blues through the rock guys like we discussed earlier, like Led Zeppelin and Cream. That's when I immersed myself into it, all styles, but I still maintained a really heavy rock background. So when I was younger I'd come around, and there were a lot of blues jams around Dallas, and I was asked to not come back to a lot of them. They'd come up and turn my amplifier off. There was a lot of that kind of stuff going on. A lot of the guys who were forerunners of that kind of style, like Jimmie Vaughan, Anson Funderburgh and Derek O' Brian were very encouraging to me. Anson and I have a great relationship, Jimmie and I have a great relationship, and it seems a lot of the resistance that I've gotten was from guys who were trying to be those guys. I've had many conversations with Jimmie Vaughan where he would tell me about the days he was in The Chessmen, when he and Doyle Bramhall had their band, and they were opening for Hendrix. All during the time of The Chessmen, The Moving Sidewalks, and that whole thing. Lo and behold, Billy Gibbons is one of the main purists of Texas blues, and he's always been very encouraging to me. He's told me to be creative, to create my own sound and not to worry about what they're talking about. But yeah there's been a lot. I remember going over to Billy's house when I was a kid. He had a loft in Deep Ellum, and he was over there playing all these electronic records. Ace Of Base and all this techno music. There were all these Howlin' Wolf records there, and I was like, "I want to listen to Howlin' Wolf's stuff". And Billy would tell me, "Man, you've got to stay in the future. You've got to keep your mind open to everything." That was really profound to me. But I've always dealt with that, the blues purist thing. There's a lot of rooms we can't play because of that. I feel that's what it is. It's cool, and I love that style more than anybody. I love the old Johnny "Guitar" Watson, Guitar Slim, Otis Rush, Magic Sam and all that stuff. But why crystallize yourself frozen in time? I've developed my style with all of that, but I feel like it's being stuck if you're going to stay there. You're just frozen. If you're not trying to move forward and develop creatively. It doesn't have to be just rock, but any type of music. I draw off of every style of music there is. Billy taught me that early on, to not close your mind off, because there's so much stuff out there that you can use and take from. It's kind of sad, because a lot of cats kind of get stuck in that. They're kind of limited in their playing, so we're limited, so we're not going to accept this. I can play that kind of stuff too. I love playing it. when I was a kid, that's what I did. I sat down with all those records I've just talked about, learned how to play that stuff early on, and developed from there, mixing the rock with it. So for me, those records and that style are part of my beginnings, so it'd be like staying in the second grade forever. (Laughs) But I need to graduate and get my doctorate. It's not like I've gotten to the second grade, this is all I need to know, and I'll just stay right here. LL : Right. I don't even pay attention to it anymore. It's gotten a lot better as I've got older. When I was younger, man, it was really hard for me around that scene because it seemed that's all there was around Dallas at the time. The thing about it was, their idea of blues wasn't even blues, it was Rockabilly and Swing music. I went through all the early Muddy Waters, and I thought that's not the same thing. This is like Jump Blues and Swing music. It was not my idea of the blues, it was Swing, and everybody was in the 1950's. I felt that was kind of weird. But as I said before, the real guys in the scene have been really encouraging to me, it's the ones on the peripheral, the ones who want to be Ronnie Earl or Duke Robillard are the ones that I've had all the problems with. NHOR : What was the one album which changed your life musically? LL : If I had to narrow it down to just one, it'd be Jimi Hendrix's 'Are You Experienced'. That record set the tone for what I did, and what I still try to strive for in my playing. My brother and his friends actually brought home an original copy of the vinyl album. They put it on, and I thought it was a new record. This was in 1987. I was just a little kid, and I had thought they had brought home a new album. The first track they put on was "Are You Experienced", and I thought Jimi was using turntables and all that. (Laughs) To achieve the sounds on that song. Because I came from the generation of the 80's and 'Purple Rain'. So when I looked at the album cover I thought this cat is trying to go for that 'Purple Rain', Prince look. Lo and behold, little did I know that's what Prince was going for. Jimi's look. (Laughs) I didn't know. For me, everything else vanished. I remember sitting in that room with that album on the turntable, and everything else went away, everything else was secondary. Hearing that backwards guitar solo - I just had no idea where that came from. It sounded like it was from Saturn, completely from outer space. I'd never heard a guitar sound like that. I remember being so confused, thinking "Man, this is great. He's about to take over the world". Everybody was rolling on the floor laughing at me. They were like, "Man, this dude's been dead for about twenty years". So it was so profound and crushing all at once. I was like, don't joke around like that, it's not funny. Because listening to that album all the way through sounded like it was brand new, even in 1987. I remember sitting with that album for the next couple of years, just trying to really dissect it and pick it apart. It had me judging a lot of guitar players. Because we had all of those bands in the 80's, back when everybody had a lead player and everybody played solos. This was the era of shred, and everybody was trying to be Randy Rhoads and Van Halen. I was needing to find someone who captured Jimi's sound. I went to see Van Halen and all of those people and I wasn't getting that type of feeling. It set a precedent by which I judged every other guitar player by. That's what made seeing Stevie Ray Vaughan so profound for me. I was like, "There it is". I was getting that same kind of intensity and power that I felt listening to Jimi's records. Stevie had captured not the exact duplication of his playing, but the sheer soul, energy and intensity. When I saw Stevie I felt the same way as when I first heard 'Are You Experienced'. LL : Right, and even at a young age I couldn't identify with it. Even as a kid I knew this was not real. Hendrix was real. There were some players, like Angus Young, who were real. I was really into Angus when I was a kid. Little did I know at the time he was just playing blues. I was reading something awhile back where he mentioned his favorite players were B.B. King and Johnny Winter. That's why I was so into him. I was into all the blues based guys like Angus, Leslie West and Alvin Lee. Of course also Zeppelin. When I was a kid, Zeppelin were like my Beatles. There was just such a heavy blues influence from them. I was just so into the blues based players, and everybody else that I would go see in those 80's bands, I'd plant myself in front of them, hone in on their lead player, check out their gear, and think, "C'mon let's go". (Laughs) I did learn a lot of licks though. Because we didn't have YouTube back then, and all the stuff that's available to kids these days. We had vinyl, cassettes, then you had to go to concerts and pray to God you could get up front. (Laughs) In the 80's it was like.. Oh you're a punk if you can't play the "Crazy Train" solo. Everybody in the neighborhood was trying to play "Eruption". Everybody. It was Randy Rhoads and Van Halen. Who were both big influences on me because of that time period. They were great, but I was drawn to just so much more depth and realness with the blues based playing. I think that was one of the things about Hendrix is that he had taken the blues and developed it into this masterpiece, his own thing. Then after I saw Stevie, that's when I realized I had to immerse myself solely into the blues. If Stevie Ray didn't do anything else in this world, be brought this generation of guitar players back to discover all the previous blues stuff. Just like Zeppelin and Cream did. But even in my generation those bands were more obscure, because they were gone already. NHOR : Do you feel that there will be a player who will come along again who will have the impact of Hendrix? LL : I don't know man. I view Hendrix, and I've talked to a lot of people who feel the same way, especially in Europe, as being on the level of Mozart or Beethoven. Those individuals are a very rare breed of people who only come around every couple hundred years. I think the same thing will be happening with Hendrix. His music will be listened to for hundreds of years. He just came from that special place where those kind of people came from, who had that kind of mindset. They just had that kind of gift. Just to put Jimi in his context, and I wasn't alive then, but to hear everything else that was going on, what he was doing came from some different planet. For someone to come from that space, I've really yet to see it. It's one thing to see players, especially someone like Van Halen.You hear the Jan Hammer, the Allan Holdsworth, and a lot of the fusion stuff mixed with rock. You hear a lot of the tapping, and scientifically you can break it down, but to hear a blues player come from a completely different realm has yet to be seen, for me anyway. NHOR : Speaking of Jimi, you were good friends with, and actually formed two bands with the late drummer Buddy Miles, who was part of the Band Of Gypsys. What was it like playing with Buddy? What was your fondest memory of him? LL : Buddy was a handful, to say the least. (Laughs) He was an amazing performer, in all aspects of his life. He was always on, he was always performing whether he was on stage or just in a room full of people. Early on I remember...We met in Belgium, at the Belgian Rhythm & Blues Festival together. I was Lucky Peterson's guitar player at the time. We met and instantly connected. Not just because of Jimi or any music, but we connected as friends. Just hangin' having a good time, and whoopin' it up there. We had a pretty fun time over there. When I came back home he was moving to Texas. So we immediately hooked up, and began writing and jamming. A lot of my favorite memories of Buddy...Of course we had some great bands, one with Chuck Rainey on bass, and I just found some recordings recently, some basic tracks we were doing that were really cool, just some rough stuff. Also jamming with Buddy and Tommy Shannon on bass. Those were great, and those were fun, but the most fun times were when we'd plug into a Fender Twin Reverb together. He'd take a Fender bass, flip it over, and play it with the low string on the bottom, and I'd play guitar. We'd both be plugged into the same amp. Buddy was a phenomenal bass player. We'd just sit there and jam for hours, plugged into that Twin, and come up with all these riffs. I wish I could remember so much of what we came up with. Rarely did we set up any type of recording equipment. But there were a couple of riffs, such as on the song "Romeo", which is on my new CD, that was one of the riffs we came up with. We actually wrote that song together. There have been a few others which have appeared on some of my earlier records that came from that time also. Later on, he got a drum kit in his living room, and I'd go out and play either guitar or bass. Nobody else would be around. Those times were some of the greatest times, when it would be just the two of us, or with Buddy's old lady there too, just creating and jamming. Then the minute someone would come in the door, he'd become Buddy again, performing and being on, and all that would go to the wayside. But when it would be just the two of us there we'd have some amazing jams. Buddy had a lot of personal issues, as we all have had, but he taught me a lot man. I brought a lot of drummers to Buddy and he went out of his way to show them things, ones who were in my band at the time. He had a wild side, and had a lot of issues, but in the end he really went out of his way to share a lot of things with me and teach me things. He gave me a lot of warnings, about all the pitfalls of the business. A lot of the issues that he had, he really didn't enjoy those issues, and he'd really warn me about them. It was a tragedy that we lost him, but I knew that he had been ill for awhile. I remember the conversation we had about six months before he passed away. He called me, and I was really upset about what was happening with him. He told me he was going to stop the treatments for his heart. He told me the doctors told him there wasn't anything more that they could do, and he only had so much time left to live. I was upset, and I remember him telling me that I needed to handle up, be a man about it, and go on. It was a real man to man talk. He was like, I'm gonna die and you've got to keep going. That's how it's got to be. But I was really upset. So when he did finally pass away, it was good that he wasn't suffering anymore. I was upset, but I was more upset when we had that talk on the phone. He told me initially that he had six months to live, so when he did finally go it was at least he was out of pain, and wasn't in misery anymore. But that was the main message that he told me, was that you've got to keep on keeping on. We talked about the addictions and all the problems. He told me you've got to be careful. It was a forewarning, like "Look what happened to me". Buddy had a lot of issues, but he really taught me a lot. NHOR : You were also a good friend of Dimebag Darrell of Pantera. How did you get hooked up with Dime? LL : I met Dimebag early on, at the Tattoo Bar in Ft. Worth, Texas. Point Blank did a blues jam at the Tattoo Bar, it was a Thursday night jam. Rusty Burns was on guitar and Chuck Rainey was on bass. Chuck actually invited me down. So it was Rusty on guitar, Chuck on bass, and they had big John O' Daniel on vocals. It was basically Point Blank. All of a sudden Dime came in, and it was like busting through the front door. Point Blank was in the middle of a song, and it was like the carnival arrived, like a big marching band parade. (Laughs) That's what I remember it being like. They just busted in, Dime ran over to Rusty Burns, fell on his knees, and started worshiping him, like "Oh, I'm not worthy!". It was just crazy. Then he ran into the club, jumped on top of the bar, in between songs, and shouted "Hold up! Hold up! Hold up!". He made the band stop, and he yelled out, "Nobody else is paying for anymore drinks!". So they just started carrying around trays of drinks, everybody was doing shots and drinking. I got up and sat in, Dime saw me play, and after that he just kind of hugged me up. After the jam we went out to the parking lot, and there were pieces of asphalt broken up, all the blacktop was broken into pieces. Dime grabbed a big chunk of it up and threw it at the street lamp, and it came crashing down on the hood of somebody's car.I was like, "Oh my God". The Dime said, "I'll give $200.00 to whoever can bust out these street lights with these rocks". Well then everybody was throwing asphalt into the sky. (Laughs) It was raining down on all these cars, and I was like, "Oh my God, we've gotta get outta here". (Laughs) That was my very first encounter with Dime. There were many other times though. He would come out when me and Andy Timmons would play together. Whenever he was in town he would come out, see me and Andy, and he always had something funny to say. He was always joking. Dime would come up and he would always rag on you. Anybody else who would say the kind of stuff Dime would to me, I'd just knock them out. (Laughs) But Dimebag would come up, insult you, and you'd just fall out laughing with him. He was just that kind of guy. Anybody else I'd be like, "Hey, we've got to step outside". But that was just Dimebag. He was hilarious. He was always acting crazy. I never saw a moment when he wasn't being hilarious, playing jokes and taking the piss out of anybody who was around. When that morning came, the day after he was killed, it was 5 a.m. when I heard he'd been shot, and it was unreal. I just remember during that whole time period asking myself, "Why? "Why?". Why does that have to happen to somebody that was just so much fun? Someone that was so good? There were many times when you'd go over to Dime's house and there'd be 15 musicians crashed all over the place. You could always go over to Dime's and crash. Of course there was always a lot of drinking going on over there too. (Laughs) But they really nurtured the Dallas scene. There's not a lot of people who do that. They really nurtured all the local musicians. They took care of, and supported everybody. From the blues guys to the rock guys to the metal guys. They went out to shows and supported them. Vinnie Paul still does. You'll go out and see a new band, and he'll be there. But they very much did it together. They were very supportive of the Dallas/Ft. Worth scene. They really encouraged everybody. It didn't matter who they were. If you were a brand new band, a bunch of little kids, they'd come out and tell them "Y'all keep going, keep practicing". Dime was a great blues player too. Most people don't know that. But he could lean on it and play the blues, man. A lot of people know him for his screaming, shred stuff, but he could just plug in clean and play the blues. I was lucky enough to get that opportunity to see that. NHOR : What effect did him being killed onstage that way have on you as a musician gigging in clubs? LL : A lot of guys I knew started packing after that. We really got paranoid, and started carrying guns for awhile. Especially in Texas, everybody's got guns down there. I knew one guy who stopped gigging completely. There was a period of time where I wasn't gigging a whole lot because I was married at the time, and home with little kids. So I wasn't going out and playing a lot like I am now. But guys I did know started carrying, and everything got really weird. Security got really weird. It was a really weird time, man. You get these nuts, and you've just got to mind your P's and Q's. It's a different generation, with the Columbine situation and kids going and shooting up their schools. The anger and the hatred is just unbelievable.I don't necessarily think it's about anything except there needs to be more love, man. The thing is, you can kind of see how Dime and Vinnie's music could bring that out in someone. It's very aggressive, very heavy and very angry. You could see how somebody who was mentally unstable could really take that and have it throw them over the edge. I'm not saying that the music did that, but you can see how some of these people could really cross the line, do something and hurt a performer. It's definitely put a whole new spin on the world of live music since then though. I went to see KISS not long ago, and there were tons of metal detectors, and people were getting wanded down. That's the first thing I thought about. KISS was the very first concert that I saw when I was a kid, and we didn't have to go through anything like that. Now, when I go see them today, I'm going through three metal detectors, someone's wanding me from head to toe, like I'm going into the courthouse or something. I thought this is great that this is happening for the band's safety, but at the same time, it was sad that it's come to this. That we would have to go through like a customs checkpoint just to go see our favorite band play. But us guys who are making our livings in the clubs, we're still really vulnerable, and it is what it is. That's why a lot of that stuff, losing friends on that kind of level, all the tragedies, car wrecks, drugs and what have you, to me that's why you've got to keep your soul right man. Because you never know. But if something happens to me I know where I'm going. (Laughs) So you've got to live right and live everyday doing the right thing, and keep your soul in the right spot, because you never know. The opposite of fear is faith. I'm not going to be scared when it's my time to go because I know where I'm going. You've got to have your soul right because you never know when the big man's gonna call you home. NHOR : To get a bit lighter here...What has been your most "Spinal Tap" moment? NHOR : You've recently secured an endorsement with Gibson guitars. You've long been associated with a Strat sound, ala Jimi. Lately though you've been moving towards a Gibson sound anyway, using a Flying V. What brought about that change? LL : Ever since I was a kid I've been into Gibsons. The early players I was into, like Angus Young, Jimmy Page, Leslie West, Alvin Lee and of course Billy Gibbons, they all had that Les Paul/Marshall sound. That was initially where I started. Then I gravitated towards a Strat mid- way through. Then I started going back and forth, and in between. But for years I was a Stratocaster player. I loved them, and they're great, and they are what they are. But recently, in the past several years, I've gone back and forth between a Flying V and the Strat. But I've always loved the sound of a good Les Paul. I actually started recording with one on the 'Higher Ground' record. Once I started recording with a Gibson it brought it all back, listening to that big, fat sound on tape. So on 'Higher Ground' I had a Les Paul Standard, and there was one that had P-90's in it. Gibsons have always been my favorites, I'd been steering towards that direction anyway, and I used a Flametop and a Goldtop on the title track to 'Salvation To Sundown'. Once Gibson heard that track,and saw me on the cover with the V, they immediately asked me to endorse them. It was an honor. And like we were talking about Joe Bonamassa earlier, he's been kind of leading the charge, making them popular again, and it was really cool to be asked to join the team. The first thing I did was contact Billy Gibbons and told him, "Gibson's got me". He was so overjoyed and elated, and said, "Okay now we're going to start having fun". (Laughs) We're in the process of him helping me build a rig to really accommodate that sound. He was really overjoyed that I was capturing that sound and bringing back some of what he was doing in the early 70's. Billy was like you need to do the least amount of work possible, because you're already working hard enough out here doing what you're doing. But when you play these Gibsons and plug 'em in, you have to do a lot less work. They're just like a Cadillac, they play themselves. You plug in a Les Paul into a Marshall and you're there. Those three things are all you need - a Les Paul, a good cable and a Marshall amp, and you're good to go. NHOR : Are you finding that you're using less effects since you've made the switch? LL : Absolutely. I've actually pulled a lot of stuff off my pedal board. Recently I've just been using two drive boxes, just to sweeten the solos. I'm just letting the Les Paul work with the Marshalls to get that tried and true sound. Dimebag used to call it cheating. (Laughs) Because you know when you plug those two together, you know what's going to happen. It's going to sound great. It's not like having to go through 15 different stomp boxes, and pile up five amplifiers together. I'm letting that combo do what it does. God bless Eric Clapton for bringing those two together back in '66. (Laughs) That John Mayall and The Bluesbreakers album was profound in so many different ways, with that being one of the main ones. But I've really pulled back on the effects lately. Sometimes I'll still have to drive the front end still if I'm using my Super Bass to get more grit out of it, so I don't have to turn it up all the way. NHOR : Have there been any discussions between you and Gibson about coming out with a Lance Lopez signature guitar? LL : They definitely want me to spend some time with them before we get into that. They're wanting to associate a certain model with me. But first getting a bit more time, and a bit more exposure with using a particular guitar. Then we're definitely going to design a Standard. I talked with them about a Flying V as a signature guitar, and they thought it was a great idea, but that they've done them in the past, such as one for Lenny Kravitz and a couple different Hendrix models, and they haven't been as popular. Because the Flying V is kind of an awkward guitar, and not everybody plays them. They were telling me that's good, but it won't be as popular as if we did a Les Paul for you. They're interested in pushing a newer model, such as the new Standards that they have. As for the finish I've been leaning towards the Desert Burst. It's a beautiful finish. But they want to get me out playing them for awhile before they design it. LL : Right. They're going to need a little time with it, perhaps a year and a half, two years. Let me become associated with that sound, and possibly a couple more recordings. But we've already picked out the model, discussed what would work the best, and what would be the most popular. I'm proud to be part of the Gibson team. It's a great company, and I'm looking forward to a nice long relationship with them. NHOR : Concerning your playing, are you satisfied with your technique and tone at this point? LL : I am. Especially shifting over to the Gibson/Les Paul combo, which is a tried and true classic, it's actually got me playing a lot more licks, and things which are a little different than what I've normally always played. I'm continuously experimenting and learning different licks. My thing is I try to take licks from different instruments and transpose them into guitar licks. I find that I get more stuff out of say horn lines, sitars and all kinds of other crazy stuff. Keyboards...Hammond organs...I listen to a lot of Jazz records and a lot of World music. I'll transpose it into a guitar lick and use it in the middle of a solo in a blues jam. I'll use it in blues, and mix that into a Pentatonic scale. There's so much stuff, especially in World music that are Pentatonic. So it's actually not that strange to transpose into something like that. I'm just continuously pulling things from other musics and adding them to my playing. I draw from everything. Then there's the guitar players. I'm always checking out other players and other techniques, developing and using stuff from a lot of great players.With this instrument I feel you can never stop learning. If you stop learning you stop growing. It keeps my mind stimulated and keeps my playing exciting and progressing to the next level. That's the whole point, to keep expanding and broadening the vocabulary of the instrument. So for me that's what I'm continually trying to do. Then I'll also go back to the basics. I'll go back to early Freddie King. Albert and B.B. and try to mix it up into one big stew. I'm constantly learning. That's what I love about YouTube. We never had that kind of stuff when I was a kid. All at a touch of a fingertip. If I was in my bedroom when I was nine years old and could've punched in "Led Zeppelin 1975", I could've been so much further because I could've seen what Jimmy Page was playing. As opposed to having to sit there with just the audio. It's just amazing what the younger generation has at their disposal concerning education. All the programs, like the School of Rock program, it's just so nurturing for all the kids who are coming up. I think it's a beautiful thing, and it's great. It's stuff that we didn't have. I take advantage of it too, in the sense of exploring other realms of music that I can add to my current style and technique. Anything that's musical I'm borrowing from and adding it to my playing. NHOR : How important do you feel it is for a young player to listen to a diversity of music? LL : It's extremely important. As we talked earlier about the whole blues purist thing, if you set your mind down into just one style of music, you limit yourself. You become limited, and that's all that you can do. In reality, having the ability to play different styles broadens your horizons in terms of a young musician working on a regular basis. Or doing sessions and that type of thing. I highly encourage all facets of music, not only for the work aspect, but for the expansion of your musical style. NHOR : Are there any players whom you have heard recently that people should be checking out? LL : There's a lot of players. There's my really good friend Wes Jeans. He's on the rise, and his style has really developed the past few years. He's another guy who has gone over to the Gibson Les Paul world. We've got a lot of players coming up in Texas. We have Wes, and Tyler Bryant. They're doing their thing and starting to grow. But as far as far as anybody undiscovered, I'm always learning from the greats, and keeping an eye out for them. One thing that really gives me hope is this King Of The Blues thing. That's showing that there's a whole new generation of young blues players who are finally coming up. That's good news on the horizon that it's continuing. Years ago I was in the Jimi Hendrix electric guitar competition. And the only reason I got into that was to find kids who were bigger Hendrix freaks than me. (Laughs) With the King Of The Blues Competition there are kids going into that who are friends, and they're able to play, join up with one another, and it's a really cool thing happening. They're continuing the blues tradition. I think we'll see a lot of great players coming out of that. NHOR : You've been putting out albums for over a decade now, and been a working musician for a lot longer. Is there anything that you wish you knew when you first started out, that you know now, that you feel any aspiring musician should know? LL : A lot of mine was that when I was a kid I thought that I had to do a lot of things that I saw a lot of the older musicians doing. I felt that I had to develop a lot of the same habits. To be able to play and live life, like we were just talking about. Today, that's not true. That was one thing, through trial and hard times that I had to learn the hard way . I thought that if I wanted to play like Hendrix, or a lot of the old blues guys that I had to do the exact same things that they did. It wasn't that anyone was swaying me in that direction, it was my conception of it. It's just like some guys think that if they want to sound like Eric Clapton they need to go get a '57 Strat and a Tweed Twin. Or if I want to sound like Jimi, or Jimmy Page, I need to go get this substance or that substance. That's not the case. You're just creating a whole lot of problems. That's one of the things about it, how it's around the industry, it's such a predominate part. I was just really lucky to find my way out of that and see the light. That's what I would say to the younger cats. Watch out for the pitfalls of alcohol and drugs, and trust your conscience. We know what's right and wrong, and that's the main thing to go with what you know is right and what's good. The other would be just practice, practice, practice. And when you get sick of practicing, practice some more. (Laughs) Keep working at it. Because it is a craft, and it is a trade. Work from your heart and you'll have it forever. To order 'Salvation From Sundown' go to this location. For more information on Lance Lopez go to this location. BraveWords.com - Where Metal Lives!